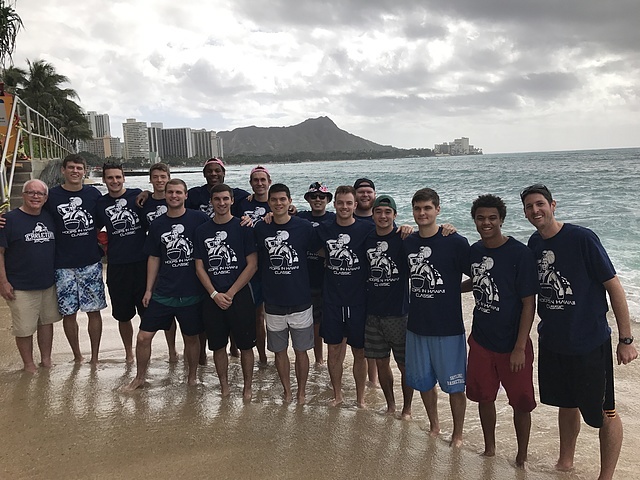 Members of the Carleton basketball team pose for a photo during a recent trip to Hawaii. A staple of the men's basketball experience at Carleton, the Knights biennial travel to the islands dates back to the 1988-89 season. Carleton College provides student-athletes with one of the top men's basketball experiences found in all levels of collegiate basketball. With an academic environment that is both highly challenging and supportive, as well as a unique trimester academic calendar that allows student-athletes the freedom to study abroad without having to miss any of the basketball season, the Carleton men's basketball experience is one of the most attractive in the nation. Carleton competes in the Minnesota Intercollegiate Athletic Conference (MIAC), one of the top leagues in the NCAA Division III. As one of the nation's most competitive conferences, the MIAC is also a conference of convenience, as all 10 of the Knight's conference opponents are located within 275 miles from the Carleton campus, including seven schools that are located within a one-hour drive. With less travel time, members of the men's basketball team at Carleton virtually have no missed class time during the basketball season. Over the last 32 seasons, the Knights have made 22 postseason appearances. Head coach Guy Kalland is the all-time wins leader in Carleton history, as he tallied his 470th win during the 2017-18 season. Under Kalland, the program has enjoyed unparalleled success, qualifying for the MIAC Playoffs 22 times and advancing to the 2005-06 and 2009-10 NCAA Championships. As one of only two active coaches in the MIAC with more than 400 wins at his respective institution, Kalland's teams are well prepared and play an intelligent, hard-nosed style on both ends of the floor. The Carleton College men's basketball program has a rich tradition of athletic achievement that is nearly as lengthy as that of the sport itself. Invented in Springfield, Massachusetts, in 1891 by James Naismith, the game arrived at Carleton just a year later when Max Exner, Naismith's former roommate who participated in the first basketball game ever played, enrolled at Carleton as a student in 1892 and later became an instructor of physical culture at the college. 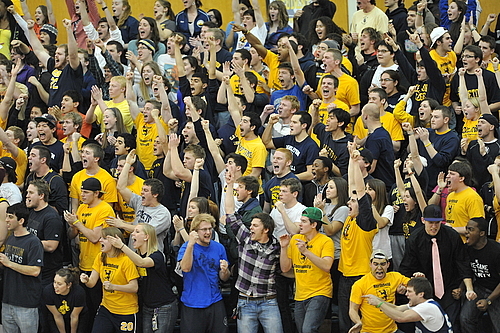 Below: Carleton fans celebrate a Knight victory at historic West Gym. Kevin Grow '18 earned All-America honors following the 2017-18 season. Carleton head coach Guy Kalland celebrates the Knights 2010-11 MIAC regular season title. Kent Hanson '20 earned 1st team MIAC honors in 2017-18 after averaging 16.8 points and 7.1 rebounds.